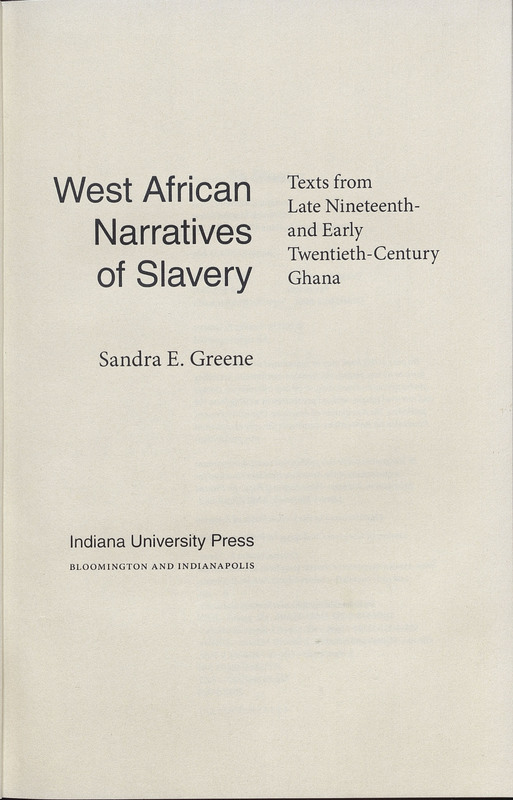 This collection of five previously unpublished or untranslated slave narratives records the experiences of West Africans who experienced enslavement within Africa. Greene acknowledges and analyzes the impact of the translator/recorder, who was often not the former slave, on what are deeply personal narratives. She asks us to consider how these experiences of enslavement were influenced by the enslaved person’s pre- and post-enslavement life. How did the enslaved person choose to remember or forget his/her enslavement? How did their enslavement influence their community? West African Narratives of Slavery: Texts From Late Nineteenth- and Early Twentieth-century Ghana. Bloomington: Indiana University Press, 2011.